Well here it is.. finally in my lasting days of Holiday vacation before the bustle of school starts again. And not only school, starting school at the local University! This is a HUGE jump for me, coming from a small City College…I am soo excited! Now I told you I cooked a lot while I was visiting Kona a few weeks ago and I am just about done with all the decedent goodness we racked up in the kitchen. 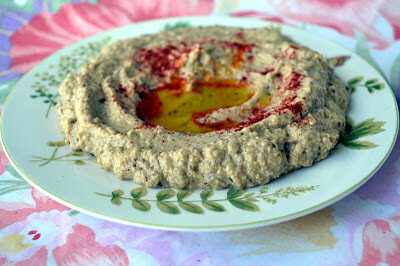 Baba ghanoush is something I absolutely adore. When I used to live in Brooklyn when I was a kid, we had a neighbor from Syria who would make Baba from scratch as well. She didn’t have a food processor, so we would hear the banging and pounding of the eggplant-and we knew she was making creamy baba! This tangy dip is addicting and is not overwhelmed with garlic. 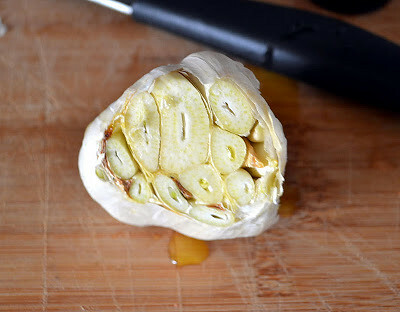 I chose to add roasted garlic as well as fresh to have a combo of the creamy and hot flavors. Fresh lemon juice adds in acidity and a pinch of cumin and paprika add just the right amount of smokiness to blend the masterpiece together. 1) Take 1 whole garlic head and cut the top off. Drizzle top with olive oil. 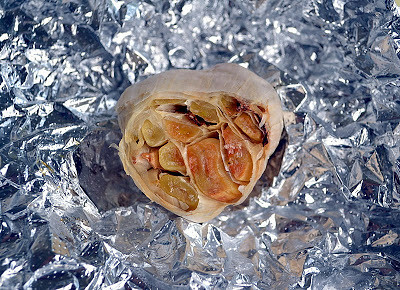 2) Wrap garlic in foil and roast in oven at 400 degrees Fahrenheit for about 45min until garlic is tender and creamy. 3) Garlic will be pretty hot, so be careful. Now just squeeze the creamy cloves out and use in your Baba dip or spread on toast! Yummm! 1) Wash and dry eggplant and cut in half lengthwise. 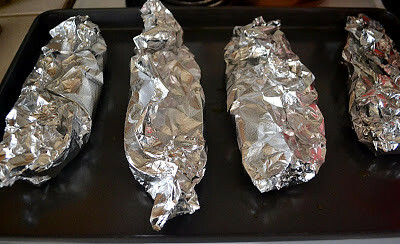 2) Drizzle with olive oil and wrap each eggplant half in foil. Place on baking sheet in pre-heated 400 degree oven for about 45 min. If you’re roasting garlic too, add the garlic packet on the baking sheet as well. 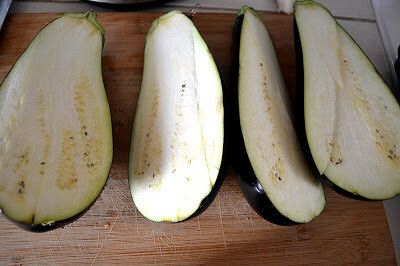 3) Check the eggplant, the flesh should be very soft and the inside very tender as well. You should be able to scoop it out easily with a fork or spoon. If not, roast longer. 4) In a food processor (or if you don’t have one, you can use a fork and lots of elbow-grease! ), add the eggplant pulp (no skin), roasted garlic, fresh garlic, tahini, lemon juice, spices and olive oil. Pulse until creamy for about 30 seconds. Taste for personal preference. 5) Garnish with olive oil and paprika. Wash and dry eggplant and cut in half lengthwise. 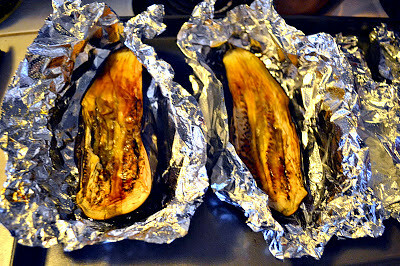 Drizzle with olive oil and wrap each eggplant half in foil. Place on baking sheet in pre-heated 400 degree oven for about 45 min. If you're roasting garlic too, add the garlic packet on the baking sheet as well. Check the eggplant, the flesh should be very soft and the inside very tender as well. You should be able to scoop it out easily with a fork or spoon. If not, roast longer. In a food processor (or if you don't have one, you can use a fork and lots of elbow-grease! 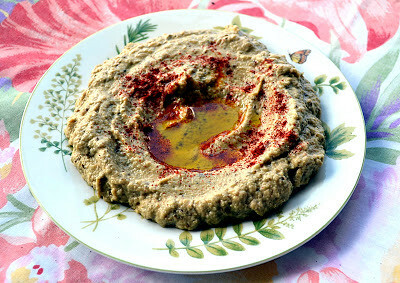 ), add the eggplant pulp (no skin), roasted garlic, fresh garlic, tahini, lemon juice, spices and olive oil. Pulse until creamy for about 30 seconds. Taste for personal preference. *Disclaimer: I am an "eyeball" type of cook, so my measurements may not be exact. Taste as you go for personal preference.